This entry was posted in Comic Pressing and tagged CBCS, CGC, comic book, comic book pressing, comic pressing, Comic restoration, pgx on July 31, 2015 by Mike DeChellis. It’s been a while, very busy summer, I should start calling it pressing of the month, but I am always optimistic. I usually post older books not because I don’t do moderns, or they don’t yield results, but mostly because they don’t have major defects that show well in pictures. 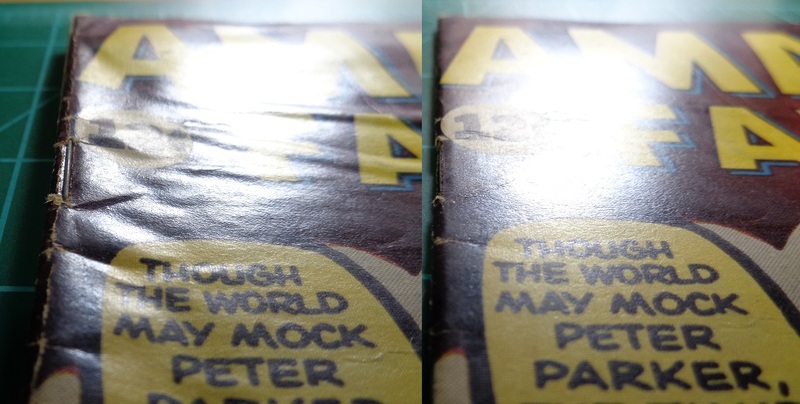 This Preacher #1 is a great example of how even moderns can be pressed properly, and removing serious defects. I was praying these creases would come out, and it worked! 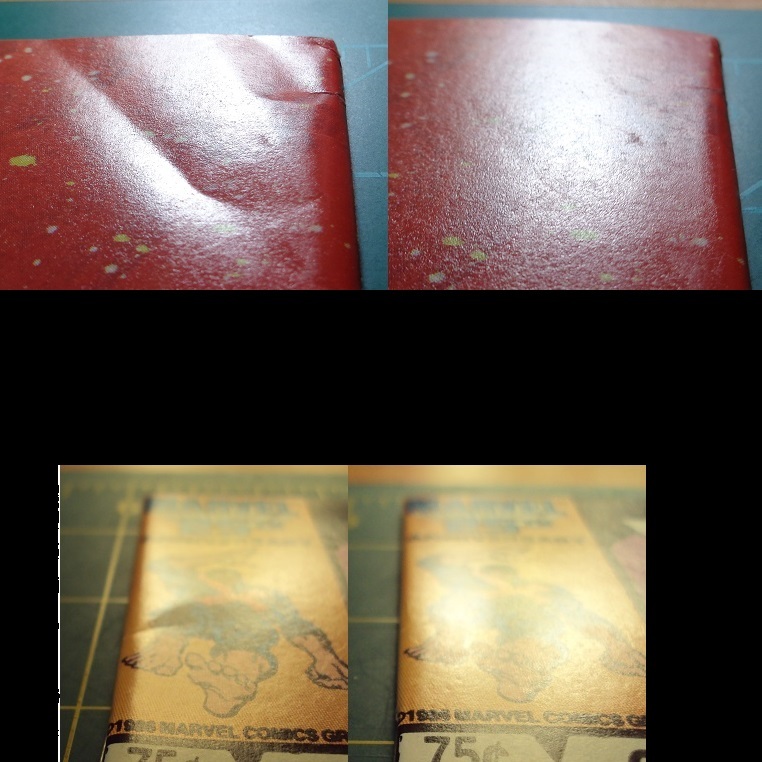 This entry was posted in Comic Pressing and tagged CBCS, CGC, comic book, comic book pressing, comic pressing, Comic restoration, pgx on June 15, 2015 by Mike DeChellis. With a treasure map, X always marked the spot, which is a good thing, but bad when it is on a comic. 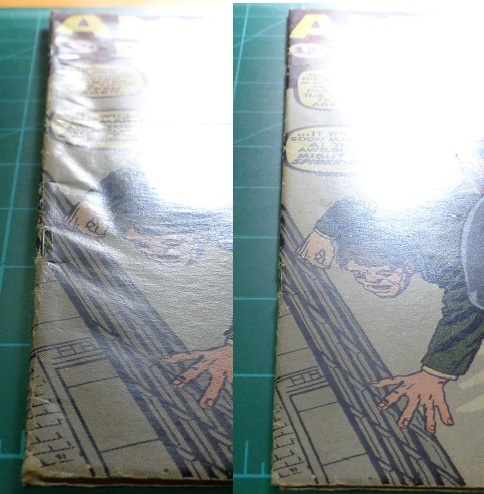 Fortunately I was able to press the indentation out of this Giant-Size X-Men #1. This entry was posted in Comic Pressing and tagged CBCS, CGC, comic book pressing, comic pressing, Comic restoration on June 3, 2015 by Mike DeChellis. Sorry it has been a while since my last post. To make up for it, here is a big one. An Amazing Press on an Amazing book. 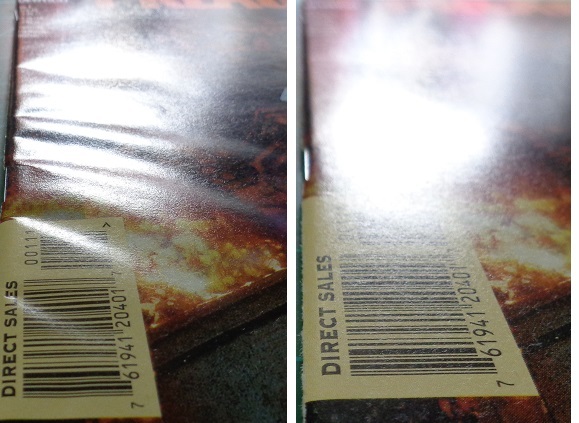 This book got a double whammy, moisture damage, and a bad stacking bend/curl. This entry was posted in Comic Pressing and tagged comic book pressing on May 2, 2015 by Mike DeChellis. Thought this time I would do a double shot of two hot books right now, X-Factor #6, and Marvel Comics Super Special #1 (Kiss), the blood in the ink issue. 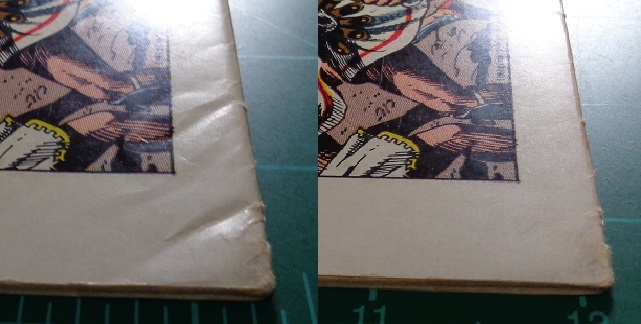 Both had common issue, a corner that got crunched, and a spine crease from the book bending, nothing a little extra work couldn’t repair. 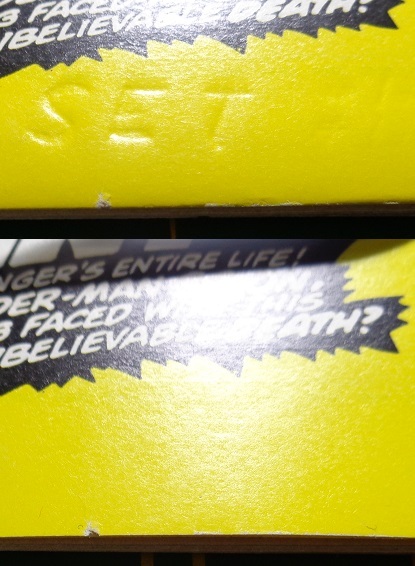 This entry was posted in Comic Pressing and tagged amazing fantasy 15, comic book pressing, pressing, spider-man, water damage on February 14, 2015 by Mike DeChellis. This copy of Amazing Fantasy #15 looked pretty good but suffered from some minor water damage which left its front cover wavy and covered with small wrinkles. These defects however make it an excellent candidate for pressing as there is only structural warping to the paper (no colour loss or missing pieces)! After a quick & affordable pressing by yours truly both the appearance & grade certainly improved. Click on the images below to take a closer look at the results.